This show has been on the calendar for a while, but I'm really late in featuring it in a post! Tonight at Nicola's Lebanese Restaurant, Bellydance by Samora will present its Post-Holiday Extravaganza! This event will feature performances by Samora, Amoraat Dance Ensemble, Samora's students, and special guests Âya of Istanbul and Suzanne! This is a chance to see some really talented performers and enjoy the warm, family-friendly atmosphere of Nicola's. The show will will start promptly at 6:30. You don't need to buy a ticket, but you will need to purchase dinner. Please call the restaurant at: (404) 325-2524 for reservations, and plan to arrive well before 6:30 so you can order dinner and be comfortable when the show starts (dinner service will begin at 5:00). There will be a variety of menu options available at $15 each. Click here for more details! 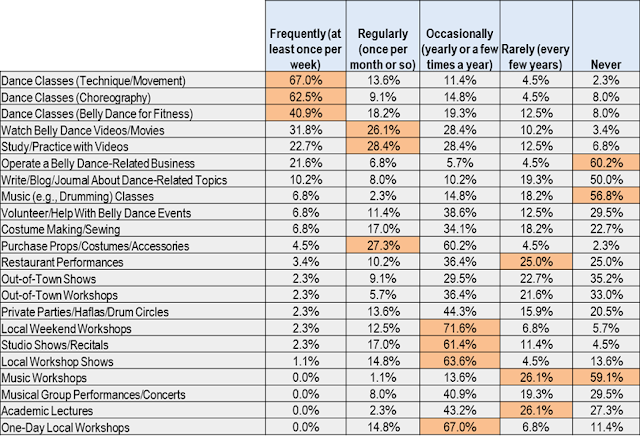 Welcome to the penultimate post summarizing the results of the 2011 Great Bellydance Student Survey! What do students want more of? Less of? 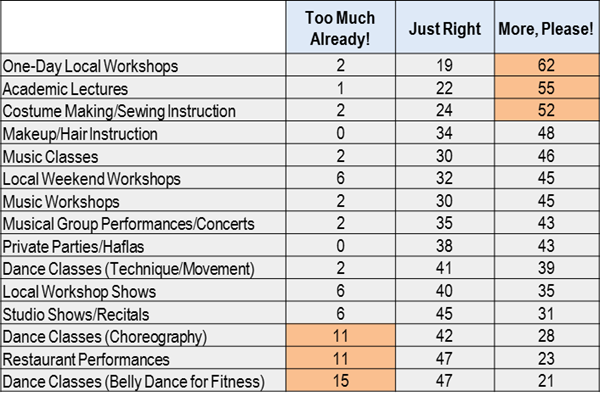 We revisited our master list of belly dance activities and asked respondents to let us know what they'd like to see more of... where they might be oversaturated... and where the availability of each activity in their area is about right for their needs. What do students want more of? The top three responses were one-day workshops, academic lectures (with 55 respondents saying they want more), and costuming/sewing instruction. Students are also interested in more makeup and hair tips, as well as music classes, concerts, and haflas. Few respondents indicated "enough already!" on any activity. 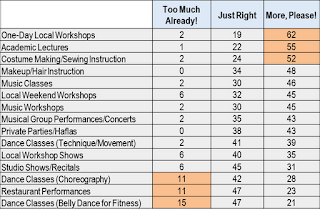 A few felt that we don't need more bellydance fitness classes, choreography classes, or restaurant performances -- but most felt that the availability of all these is "just right." The implications for teachers and event producers are obvious on this one. Students are clearly hungry to learn more about the culture and music behind this art form, and to have more opportunities to listen to music and get together for more casual social events. And there's a big opportunity for teachers to share their costuming, sewing, hair styling, and performance makeup skills, whether in standalone workshops or as part of a weekend workshop. What are students' goals for 2012? 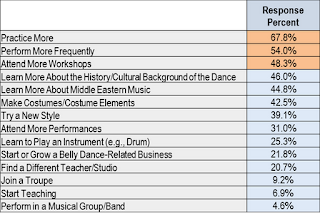 In the interest of helping teachers support their students in and out of the class setting, we asked respondents for their belly dance-related goals in the coming year. Many of the most popular goals are closely linked to the topic we just covered -- learning more about culture, history, music, and costuming. But the top three goals were to practice more, perform more frequently, and attend more workshops. In addition, 39% are interested in trying a new style. Again, the implications for teachers and event producers are fairly obvious. Providing performance opportunities is key to attracting and retaining students. But how can teachers help students with the most popular goal -- "practice more?" Every student knows that practicing between classes is essential in getting the most out of the class and growing as a dance. And most teachers can tell which students have been practicing. So why is it hard for students to make time for practice? Perhaps teachers could offer regular tips on how, what, when, and where to practice, so it's not so intimidating. Encouragement via e-mail or other online communications between classes might also be appreciated. And performances always drive practice -- so as performance opportunities increase, practice should also increase. Why do students love belly dance? 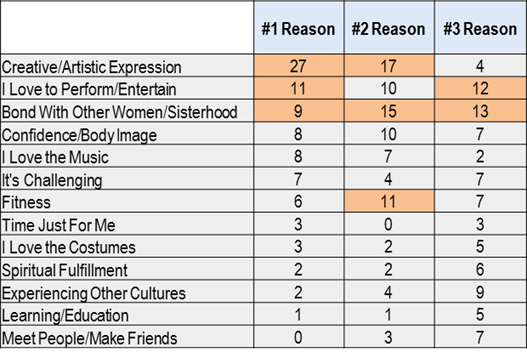 Really just for fun -- but also because it may spark some ideas for teachers and event producers -- we asked respondents what it is they love most about this art form. Not surprisingly, what keeps most students engaged is the outlet for creative or artistic expression that belly dance provides. Many also said they love entertaining people. And quite a few mentioned the bonds and feeling of sisterhood that they feel with other enthusiasts. Several respondents offered verbatim responses to the effect of "all of the above!" And one simply said "This is who I am." Our final installment will cover the verbatim responses to the final, open-ended question on the survey. These include comments on the accessibility of classes and events, the belly dance community, instruction, music, and performing. This weekend, Alicia of BellyCraft is in town for workshops and a show brought to us by World Belly Dance Alliance. 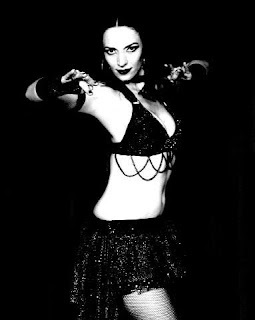 Hailing from south Florida, Alicia is a second-generation belly dancer who has become fluent in the darker side of tribal fusion. Alicia will bring her skills to Pera this weekend with a series of workshops, and she'll be performing in a show Saturday night that is shaping up to be a big event for the metro Atlanta community! Lots of local performers will be strutting their stuff, including Jenny of WBDA, Amani Jabril, Heleshia, Tamara, Jendayi Dance Company, Holly, Mina, Tamar, Kumari, Mariana, Nawar Azhara, Amina, and Lacy Perry. Visit the WBDA Web site for more information and to purchase workshop registrations or show tickets! RSVP to the workshop Facebook event for all the latest updates! It's difficult to announce every new class session here on Yalla Y'all. However, periodically we will feature information about various instructors around town. 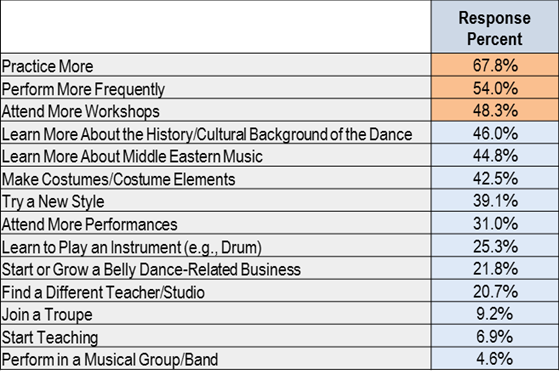 Based on the results of our recent survey, a fair number of local students are interested in learning more about Lebanese-style belly dance. Amani Jabril is currently building a Lebanese-style class... if you are interested in attending, please contact her! If you've seen Amani perform, you know that she captures the earthiness and sensuality of this art form oh-so-beautifully (she will be performing in this Saturday's Alicia workshop show at Pera). As both a working anthropologist and a professional dancer, Amani offers a practical, street-smart view of not only the technical aspects of music and movement, but also the culture and the motives from which the dance as cultural expression is created. Taken from her own experiences in the field in Egypt, Lebanon and the U.A.E., in addition to ex-pat groups in the United States, Amani's classes include favored combinations as seen on the contemporary dance scene as well as movement from her own signature style. 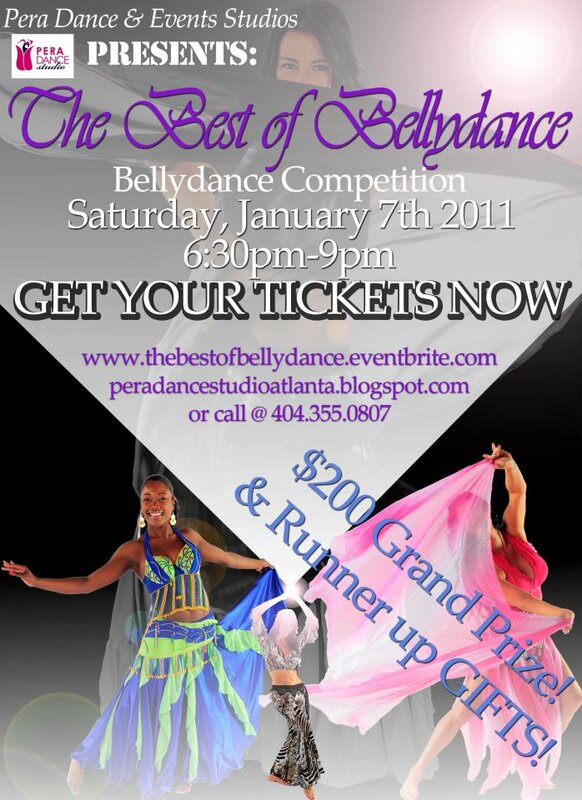 Just a reminder that this Saturday, Pera Dance will be hosting a belly dance competition called "The Best of Bellydance." Doors open at 6:30 and the contest begins at 7:00. I haven't heard a whole lot of chatter about who will be judging, but I would expect to see some of Atlanta's most discerning performers and community members at the judges' table. Tickets for watching the show are just $12 at the door. Click here for more info! Welcome to the first installment of the results of the 2011 Bellydance Student Survey! 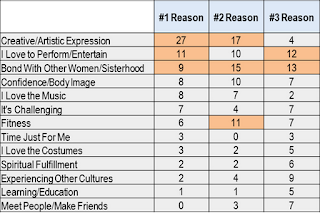 We had a total of 89 respondents, and their input provides some great directional input for instructors and event producers on the state of the belly dance "consumer" market. I wanted to do this survey because I've heard so many questions and hypotheses about what students and even attendees want, and why class, workshop, and performance attendance seems to have declined. Everyone is well aware that many people are out of work or working longer hours to get by in the current economy. So what can those who produce products and services for the belly dance community offer to attract and retain more business? My day job is in marketing, and the best marketing is always based on an understanding of what the market really wants (and most importantly, what they will pay for). Many companies can't afford to do the kind of research that will give them these insights. My goal was to combine my marketing capabilities with my access to the belly dance community and begin to provide some insights that will make the community stronger by making the "producers" more successful and get the "consumers" more involved. I'll be sharing the insights from the survey in several installments. The first will focus on the profile of the respondents and the styles of dance in which they either currently participate or would like to try. Please feel free to ask any questions about the results. Finally, I want to thank everyone who responded to the survey for their honest and thoughtful input. And thanks to the people who got involved and shared this survey, especially the teachers who encouraged their students to participate! 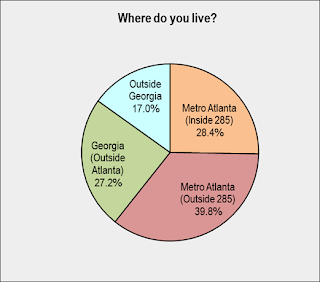 This survey was intended to focus on the area served by Yalla Y'all, which includes metro Atlanta and north Georgia, though it was open to respondents in any location. 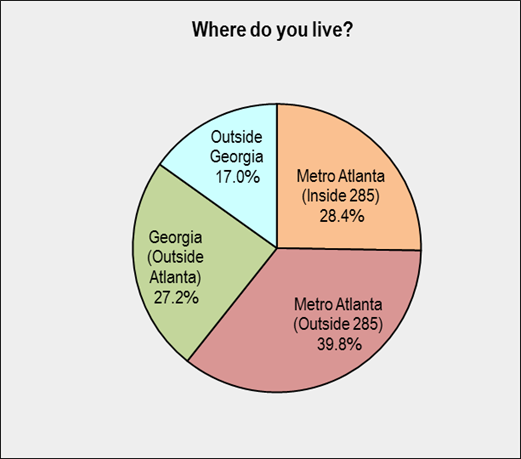 Most respondents (68%) were from the metro Atlanta region, though the remainder of the state was well-represented, and 15 of the 89 total respondents live outside the state of Georgia. All but two were from the Southeast, including North Carolina (4), Tennessee (2), Alabama (2), Florida, and Texas. 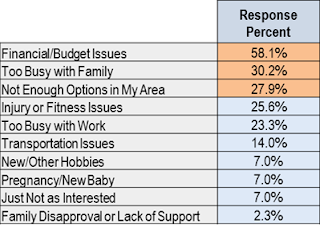 You'll find that some responses have specific meaning in the metro Atlanta area, but many of the insights from this survey are likely to be widely applicable. 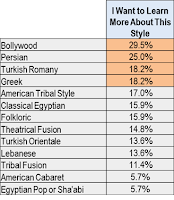 In listing the dance style they primarily study and perform, respondents were split pretty evenly between what most of us classify as "cabaret" and "tribal" styles. 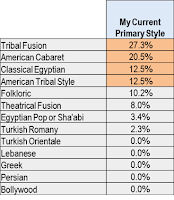 About 40% identified themselves as primarily Tribal Fusion or ATS dancers, and American Cabaret, Classical Egyptian, and Egyptian Pop styles total about 36%. Several other dancers identified themselves as primary folkloric, theatrical,or Turkish Romany performers. 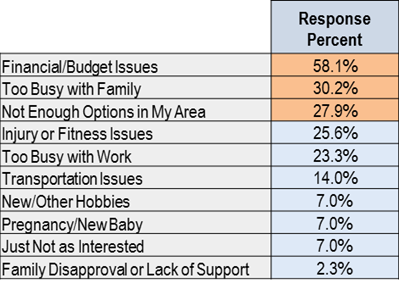 I'm pleased that the survey includes a healthy mix of styles, with respondents representing many facets of our diverse community. 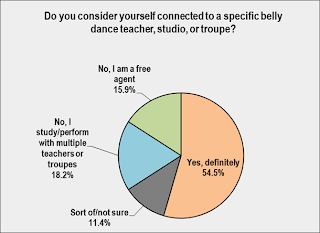 We were curious to learn how many respondents consider themselves connected to a studio, teacher, or troupe. 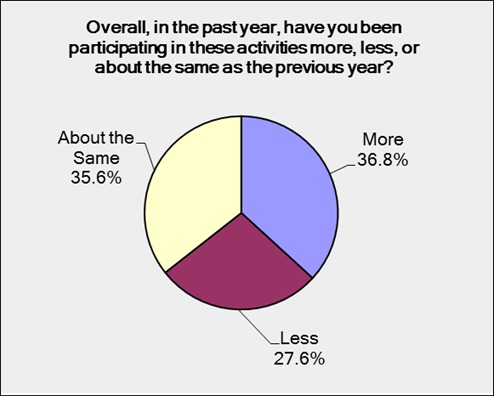 Over half of respondents indicate that they have such a connection, while the other 45% study with multiple teachers, consider themselves "free agents," or are not sure how to label themselves. What are the implications for teachers? Almost every teacher's goal is to build long-term relationships and loyalty among students; it's possible that up to 30% of the student market may be seeking a teacher, studio, or troupe as their belly dance "home." What styles do students want to learn more about? Responses to this question may give teachers and event producers some ideas for new classes and workshops. 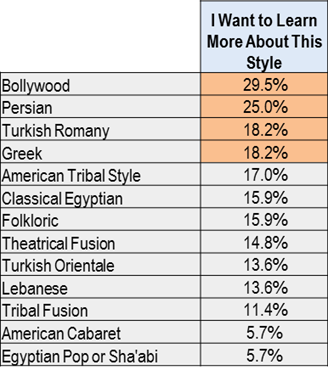 Almost 30% of respondents would like to learn more about Bollywood-style dance. Persian dance also seems to be enjoying a surge in interest, with 25% of respondents interested in trying it. Classes or workshops in Turkish Romany and Greek dance may also attract students, as well as ATS, Classical Egyptian, and folkloric styles in general. Overall, there was not a single style listed that did not generate some interest. What styles did we leave off the list? 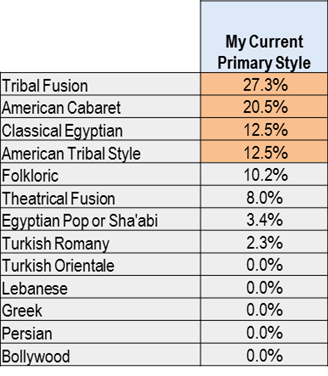 Several students identified themselves as students or performers of styles not listed in the survey, including Gothic (5), African (2), Debke, Tunisian, other Romany styles, Modern Fusion, Bhangra, historical reconstruction dances, other group improv styles, Balkan dance, and international folk dance.